These summer- and fall-blooming perennials sprout the most amazing foliage. Hostas are native to Japan, China, and Korea, where they grow in moist woodlands, open grasslands, and along stream banks and rivers. A foliage plant with summer and fall bloom, other common names include plantain lily and funkia. 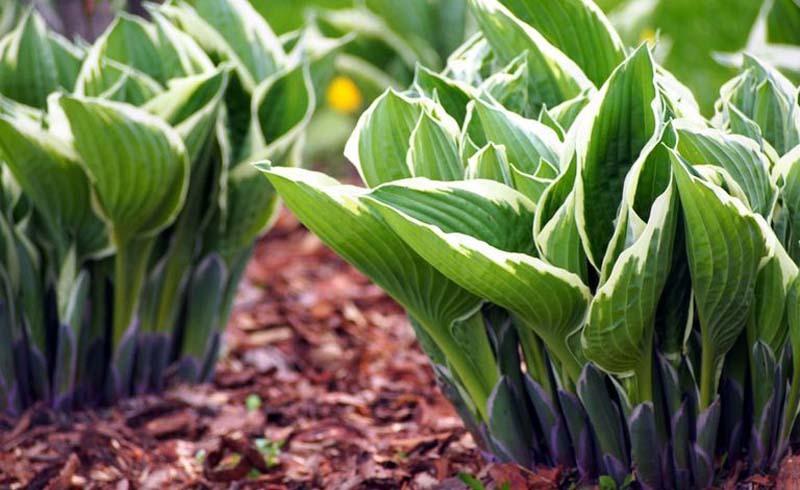 Plant hostas in evenly moist, humus-rich soil in light to full shade. Hostas are tough, versatile, and adaptable. Filtered sun is best for the colorful varieties to reach their full potential, especially gold and blue forms. The green-leaved varieties are the most shade tolerant. Most species need protection from too much direct sunshine, especially hot afternoon sun when temperatures are high. Variegated varieties, especially those with a lot of white in the leaves, burn very easily. Blue-leaved varieties will bleach to green with too much direct sun. Plants with thick and waxy leaves are better adapted to dry soil conditions than thin-leaved ones, but none will thrive or even survive with dry or thin soil. Hostas emerge late in the season but quickly unfurl to fill their allotted space. They grow slowly and may take two to four years to attain their full size, longer for the largest species and cultivars. Allow plenty of room when you plant to accommodate for their mature size. Small varieties spread three times as wide as they are tall. Medium-size varieties spread twice their height, and the larger varieties are at least as wide as they are tall. 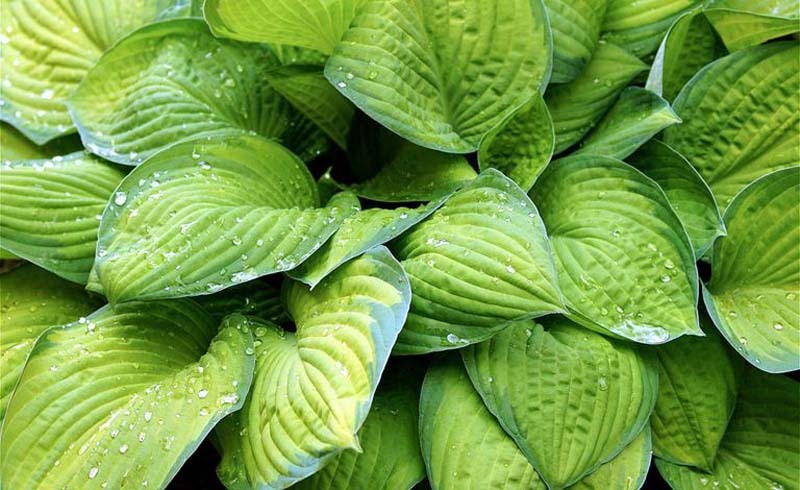 Hostas are disease-resistant, but their succulent leaves are no match for slugs and snails. Keep a watchful eye on the emerging leaves and pick off the assailants as you find them. In moist, humid climates, use exclusion techniques such as rings of ash around the plants, or use saucers of beer as bait. Hostas are the mainstays of the shade garden. Their luscious foliage is unparalleled for accent and groundcover effect. Plant hostas with ferns, wildflowers, and shade perennials on the north side of a house or under the canopy of large trees. Use them as specimens or accents on the shaded side of a shrub border or under flowering trees. In the darkest recesses between buildings, under carports, or in narrow passages, hostas will grow and thrive if the soil is rich and moist. Take advantage of the fact that hostas emerge late and plant the large open expanses with spring-flowering bulbs and ephemeral wildflowers such as toothworts (Dentaria), spring beauties (Claytonia), and trout lilies (Erythronium). As the early bloomers die away, the newly emerging hosta leaves will hide them from sight. Snowdrops, miniature daffodils, and winter aconites (Eranthis) are good bulb companions. Combine the lovely foliage with sedges (Carex); ferns such as ostrich fern (Matteuccia struthiopteris) and lady fern (Athyrium filix-femina); and foliage perennials such as lungworts (Pulmonaria), Siberian bugloss (Brunnera macrophylla), and wild gingers (Asarum). In cooler areas, combine white-flowered H. plantaginea with variegated Japanese silver grass (Miscanthus sinensis 'Cabaret'), garden phlox, and other perennials in borders protected from the hottest afternoon sun. Use the medium-size varieties as groundcovers in front of flowering shrubs or in mass plantings of mixed leaf colors and shapes under shade trees. Plant the small-leaved selections in rock gardens or in containers.